I've been bad this month, and have purchased a lot of items I didn't need... so I'll probably post a few of those purchases here! 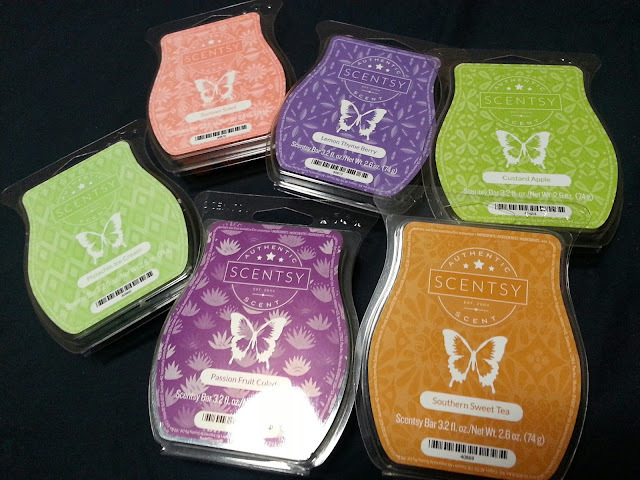 My Spring/Summer Scentsy bars arrived this week! I was so excited to get them! These were the 6 scents that I narrowed it down to (for the time being at least - haha!) and I'm quite happy with the scents! All the stickers are so Spring and Summer! Pistachio Ice Cream - Pistachio cream and coconut garnish vanilla meringue. The coconut in this is very light - so if you're not a fan of coconut, don't worry! I know sometimes they are strong and just over power everything. But it's light, I promise! The pistachio smells somewhat cherry, but it's nutty, and vanilla-y. Great scent. I surprised myself with this one. Summer Soleil - Pineapple and coconut milk top fluffy vanilla marshmallow. I was mostly looking forward to this for the vanilla marshmallow scent. But I just don't smell it in the bar at all. Pineapple and coconut don't stand out much for me either. It's just a sweet, creamy, type of scent. Not bad by any means, but it just doesn't match the description to my nose. Lemon Thyme Berry - Sparkling lemonade and strawberry sprinkled with crushed thyme. I love the description on these, like you can actually picture these fruits being sprinkled, and sparkling lol. Anyway, this is fruity, just how I like them! But it's also fresh... not laundry type of fresh (you know those scents).. it's perfect for summer. The thyme is not strong, but everything works so well with one another. I think this is my favourite of the six. Passionfruit Colada - Honeydew and passion fruit surge with sugarcane. Something in this smells a little "powdery" to me - but not overpoweringly so. I do like this. It isn't my favourite of the six, but I will definitely use it because it's fruity and I tend to stick to those scents. Custard Apple - Pineapple, sugarcane, and mango capture the essence of custard apple. This smells great! You definitely smell the pineapple, and sugar, slight mango. Its somewhat creamy too. I think I will be warming this one a lot! Southern Sweet Tea - A splash of juicy peach, orange juice, and white tea. Ah! I love this one! It really does remind me of a peach ice tea. The scent is strong, but none of the notes are overly strong. The peach is definitely the most noticeable note from them all. I could drink this! Haha. It's definitely a perfect scent for summer. And I will probably buy a back up of this one before they switch back to Fall/Winter scents in September! If you decide you'd like to try any of the new scents, I'd really appreciate it if you could use my Scentsy link! http://www.deidrec.scentsy.ca You can shop from anywhere in Canada or the USA, and it will ship directly to you! There is also a sale section for discounted products, and combine and save, where you save some money on bundling products together! If you already have a consultant, I understand! I'm not sure if I mentioned it in any of my old posts from a few months ago, but in October we decided to purchase a new bed. I only had a double size which I had purchased way back in 2004. It was getting up there in age. Some of the springs were starting to poke out of the sides, and the frame just was making so much noise. I decided to upgrade to a queen size, which was a mission in and of itself trying to get it upstairs into my room. We live in a townhouse and the staircase just wouldn't allow us to get the box spring up. Thank goodness for having a large window upstairs in the back of the house, because we had to pull it up through there! Anyway, I'd say about in November or so, we noticed that the box spring was kind of loud. I put it off to thinking that it was still being worked in (possibly) and maybe the heat was making it make these noises. At least that was one of the possible reasons I had read online. Speed up to now, and the sound was just unbearable. Doing some google searching, we discovered that it could be that the cardboard they place inside was just not glued down enough, and that's what was causing the noise. People online claimed it could be fixed by gluing that cardboard piece down better, or just ripping it out. After much discussion, we decided to just rip it out. And what a huge difference it made. It honestly doesn't sound like anything anymore. And while I'm not impressed that I had to do it, I'm just glad now the bed won't be so noisy - even turning in our sleep was causing it to creak, and now it has stopped! I placed an order last week for new polish. I keep seeing mauve nails everywhere, and I surprisingly don't have one in my nail polish collection. I ended up placing an order on Nail Polish Canada late Sunday night (or really early Monday morning, if that's how we want to look at it! lol) and it was marked shipped Monday afternoon. I received it Tuesday! Super super fast shipping! 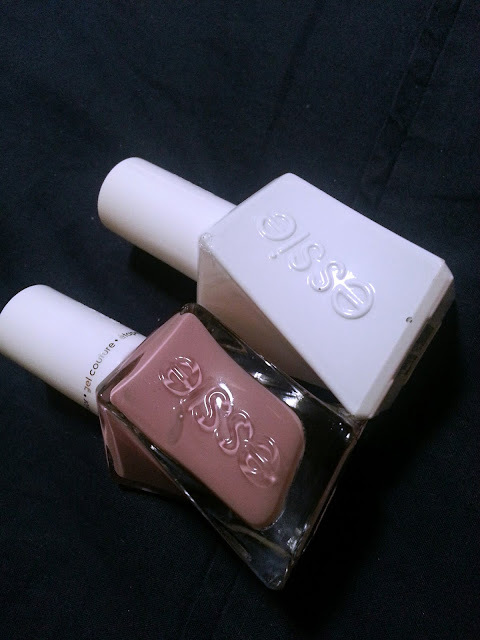 I ended up picking Essie gel couture polish in Touch Up. It's so beautiful! And I picked the top coat to seal it all in. I've been wearing it since Tuesday when it came in, and I'm impressed! I'll do a better review on this in a few days! But I'm loving it so far! Do you guys watch The Mindy Project? It was just announced a few days ago, that the next season (Season 6) will be the finale season. The finale episode was good, so it will be interesting to see what happens in the last season! I told you I made too many orders this month. Here's one more. 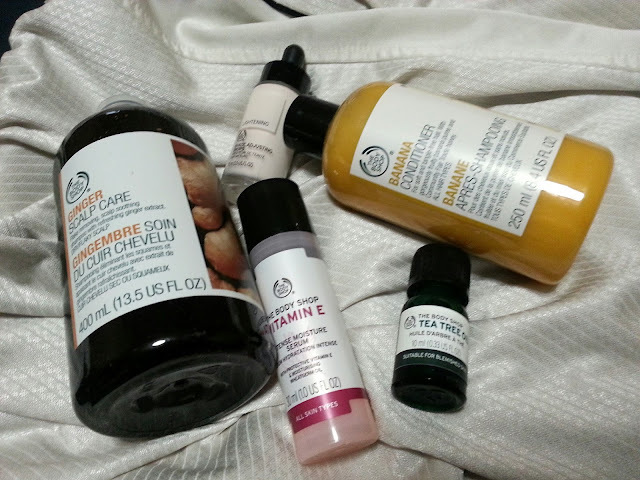 I decided to make an order at The Body Shop. I really wanted to try the lightening drops for foundation. I have a ton of foundation that are just a tad too dark for me, so I'm really hoping these help! I'll do a full review for sure! They also had a promotion going on where if you buy 2 items, 1 is free. Or buy 3 and get 2 free. So of course I bought 5 items, and 2 were free. I also chose tea tree oil for random breakouts, a vitamin e serum (I need a new serum soon) and then a shampoo and conditioner. I'll do full reviews on all of these when I try them out!